Stabilize and protect cellular RNA at room temperature in various samples including cultured cells, animal tissue, bacteria & fungi, soil, stool and plants. 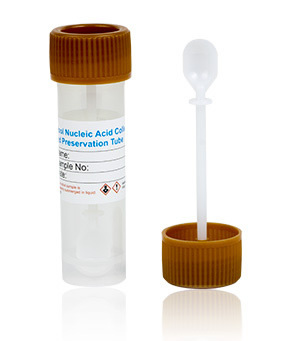 Preserve microbiota profiles for unbiased, reproducible results using the Stool Nucleic Acid Collection and Preservation System. Enrich and purify circulating cell-free DNA and RNA as well as exosomal RNA for biomarker discovery. Norgen‘s unique suite of sample preparation kits provides a fast, reliable and simple procedure for sample collection and preservation as well as for the subsequent purification of inhibitor-free RNA (including microRNA) or DNA from various specimen types. The optimized preservation reagents grant the longest stability of DNA and RNA in e.g. urine, saliva and stool samples at ambient temperature. Purification is based on Norgen’s proprietary resin as the separation matrix. This unique patented silicon carbide resin allows rapid purification of RNA or DNA without the use of phenol or chloroform from a variety of samples. Due to the superior affinity of the resin even cell-free circulating RNA and DNA as well as exosomal RNA can be isolated from small sample amounts with high sensitivity. The RNA and DNA are of the highest integrity and can be used in many downstream applications including real-time (RT) qPCR, methylation-sensitive PCR, next generation sequencing (NGS) and DNA array analysis. A number of kits is available with CE-IVD marking in accordance with EU Directive 98/79/EC.